Kieffer Moore (second left, yellow) in action against Posh. Peterborough United have had a bid accepted for free-scoring League One striker Kieffer Moore. Moore (25) is available for transfer from Championship side Ipswich Town. He has spent the first half of this season on loan at League One side Rotherham United for whom he’s scored 13 goals this season. Josh Cullen (left) in action against Posh. Only Posh striker Jack Marriott has scored more goals (17) in League One this season. Moore is also a target for other League One clubs, including Rotherham. Ipswich paid Forest Green £20,000 for the powerful striker in January, 2017. He’s never started a game for the Tractor Boys, but he’s believed to have an initial price tag of £250,000. Posh director of football Barry Fry, the man in charge of transfer negotiations at the ABAX Stadium, also revealed today (January 3) the club have missed out on their main midfield target, West Ham midfielder Josh Cullen. Cullen (21) starred in Bradford City’s promotion push in League One last season as a loan player. He’s been on loan at Championship outfit Bolton this season. “We have had a bid for Kieffer Moore accepted by Ipswich,” Fry stated. “But there are a lot of add ons attached which our chairman might not fancy. 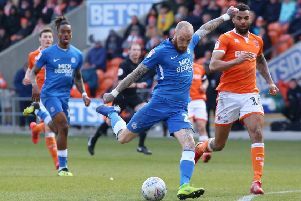 “We believe Moore playing alongside Jack Marriott with Marcus Maddison supplying the crosses would be formidable in League One. “I thought I had the Cullen deal sewn up. West Ham’s owners had been very helpful, but Bolton have suddenly started picking him and he is now going to stay there. On-loan Posh goalkeeper Jonathan Bond will formally extend his stay at the ABAX today. His current club Reading have reserved the right to sell the 24 year-old if they receive an acceptable offer during the January transfer window. “It’s the only way I could get the deal done,” Fry added. Posh are also chasing a right-back. Posh have agreed to extend the loan deals of goalkeeper Josh Tibbetts (Royston), striker Mathew Stevens (Kettering) and Morgan Penfold (Biggleswade). Midfielder Callum Chettle is expected to join National League side Fylde on loan for the rest of the season today.